I am grateful and thankful that 2011 was a good year for my family. I made many new tea friends and had the opportunity this year to visit Guangzhou, Hong Kong and Malaysia for my tea adventures. For next year, I will be visiting these places again as well as Yunnan to learn more about tea. If any of the readers are interested, it would be a pleasure to meet up with you at these places and I would show you the sights and sounds of the tea markets. Free. I got to drink lots of pu erh tea this year. For ripe pu erh this year, the 2004 Xiaguan ripe, the ‘04 brick from Lau Yu Fat (Hong Kong) and ’06 Hong Tai Chang cake were very impressive ripe pu erh tea in my opinion. I was also fascinated with raw pu erh that has the smoky aroma. I was smitten with the 2007 Xiaguan te-ji tuo. I found the brew simply delicious and I finished 2 tuos within one month. For next year, I will endeavor to find out more about smoky raw pu erh tea during my travels and will continue to document those tea I have drank. 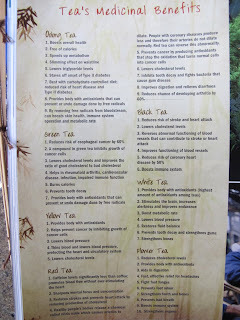 I intend to revisit some tea I had consumed ….. I did buy doubles and triples ….. and see whether what I had blogged about the teas still hold true. In one my earliest blog on tea, I stated “For me, its a happy and "at peace" sensation when I taste a good cup of tea.” After 3 years of blogging, that statement continues to summarize my tea drinking adventures. Thank you for reading. Thanks for the feedback and encouragements. Happy New Year 2012. I was browsing the internet when I came across this website - http://www.thinkgeek.com/caffeine/ea88/. The picture also from the website, had me started whipping up my credit card to make an order. This is the one.....the tea that Master Yoda drinks. The site describes the tea as "Dagobah Green Tea is the drink of choice of Jedi Masters. Just because a planet is devoid of civilization doesn't mean it's not civilized. Deep in the jungles of Dagobah grow the most delicious green tea leaves in the galaxy. If you need a moment alone to ponder the Force, do it while sipping a hot cup of Yoda's favorite tea." The tea is a blend of green pu erh, white peony and matcha. Each tin has 1 oz of tea leaves which is "enough for 14 cups." 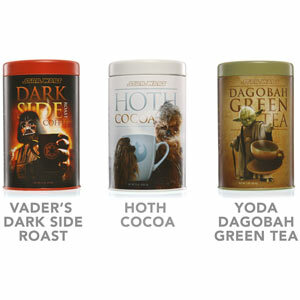 The entire set of Vader's coffee, Hoth cocoa and Dagobah tea goes for US$29.99. Drats! Its out of stock and its only for sale within USA. I have 'vibered' my American friend to get me this order for me. In the movie The Empire Strikes Back, one of Yoda's quotes was "No! Try not. Do, or do not. There is no try." This is the 2007 Xiaguan tea factory "te-ji" tuo. Pu erh tea are usually compressed into cake, brick or tuo shapes before they are sold in the tea markets or shops. This makes for easy storage and takes up less space as well. If you look at the last pix, you can even see the Xiaguan logo when the tea was compressed into the factory mould. There is a hollow at the bottom of the tuo, which I was told, helps to allow moisture to escape during the drying process. Xiaguan tea factories are famous for their pu erh tuos and iron disc cakes. The latter cakes refers to tea cakes that are compressed and shaped into flat cylindrical discs that normally come in the standard 357g weight. I will purchase this disc in my next teashop visit and will put up the pix of the disc. I should add that these tuos and disc are very tightly compressed and you would need at least a metal letter opener or a tea pick to break up your tea. Be careful......I accidentally poke myself.......drinking tea has its hazards. I had bought this raw pu erh tuo locally at Amoy Tea at Sims Drive. This "te-ji" (special grade) tuo was sitting in an obscure corner of the shop when I decided to buy a tuo and give it a go. The 1st 5 infusions was, to me, the highlight of this tea. The aroma was a light flowery bouquet with a mild citrus scent. In addition, there was this strong burnt-firewood scent in the tea. I had found out that, during the pu erh processing, the tea leaves are pan fried at one stage, and wood was used as fuel in the pan frying process (there are now tea factories using electrical pans for convenience and I was told, is easier to control and get a even heat). I had mentioned in my earlier blogs to keep all your tea away from odours as tea absorb smells easily and its hard to get rid of that scent. This Xiaguan tuo as well as as many of the Xiaguan pu erh, had absorbed some of the burning firewood smoke, thus the signature smoky scent in their tea. The highlight, to me, of this tea is that the smoky scent combined with the light flowery and citrus aroma makes this tea a wonderful brew. I would like to add that if you have never tried a smoky pu erh like this tuo, you may need a little time to get used to it. My wife, in her very first sip of this tea, commented on the strong smoky burnt wood scent......I told her that this scent is part of this Xiaguan tuo and told her to evaluate the entire tea again with this scent in mind. And now.....like me, she likes this tea very much. There are tea drinkers I know that told me the smoky aspect of a tea distorts the true taste of the pu erh. Many will agree and disagree with this statement. For me, you should buy and drink the tea you like. Every tea will have its own distinct aroma and taste and every tea factory have their own style of tea processing.....which is the very reason I enjoy drinking Chinese Tea.......it is a wonderful adventure for me - every time with every cup. This 2007 Xiaguan "te-ji" tuo comes bagged in hypo-allegernic bag (5 tuos in a bag). I had purchased a single tuo locally from Amoy Tea for $5 to try and subsequently buying a few bags of this tea a couple of weeks later. I would encourage you to try out a tuo if you are at the teashop (I do not have any business interest in the shop and will not receive any commission). Highly recommended - for $5. This is my first Hong Kong pu erh cake that I had purchased in 2007. 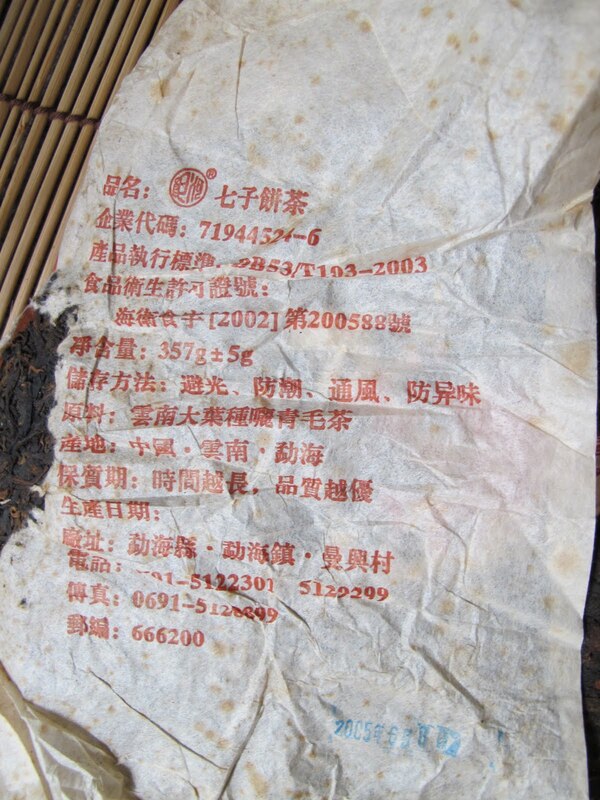 This is a 2006 Yang Ji Tian ripe pu erh cake. One of the nice things about buying from pu erh teashops in Hong Kong, was that you could, most of the time, sample a tea before you part with your money for that tea. As I drink quite a fair bit of tea, I try to sample the tea before a purchase. Yes, you are unable to sample a tea when you buy from the internet or at certain teashops....... but if its a small amount, its fine but if its expensive, I suggest you buy only from a reputable seller or just buy a sample. I would advise you not to plonk down your money if you cannot do the above as you may regret the purchase when the tea is not up to your liking. Back to this tea; this 357g cake feels and look thicker and bigger, but this simply means that the compression of the tea leaves is low. I could break up the tea cake gently with just my hands and this resulted in less tea dust and fannings. I like tea cakes with low compression as it is less dangerous for my hands (I accidentally poke myself with a tea pick when I tried to pry open a tuo last week - thats another story). The aroma of the tea is very strong and fragrant. It has a earthy and a 'chinese herbal soup' scent. This tea has similar taste characteristics of the 2004 Xiaguan ripe (see blog 6 Feb 2012) but with a milder sweet aftertaste. A brew can make 10 very good infusions. This is a nice cake and I had consumed half the cake within 3 weeks. But I digress - I have, in the past couple months, encountered great difficulties uploading pictures on blogger. It sometimes take more than half an hour for one picture to upload. It is doubly frustrating to see an upload error after waiting for a long time. Posting the pictures for this blog entry was very excruciating this time, and I hope readers can recommend me a solution if this problem continue to persist. This well written article is from AFP, written by Judith Evans (Nov 3, 2011) titled “Cultural thirst drives China’s high-end tea boom”. “Fifteen years ago the Lam family business picked up a consignment of aged tea from a defunct Hong Kong restaurant. Its value has since risen by a factor of 10,000, as the Lams have found themselves part of a boom that is both investment fad and cultural obsession. "It's like magic," managing director Sam Lam told AFP as he prepared tea according to the Chinese ritual, pouring boiling water through rough leaves and then into tiny cups to drink, and spoke of the profits to be made. The tea is pu erh, a dark tea that is fermented after drying and whose taste mellows with age. Its history is thought to date back between one and two thousand years, with legends of growers in mountainous Yunnan province ferociously guarding their cultivation secrets. Over the past 20 years prices for aged pu erh have rocketed, while China has encouraged renewed development of a luxury tea culture which parallels that of wine -- partly as a source of national pride in a home-grown high-end product. With over 70,000 tea businesses in mainland China, skilled buyers must taste tea in order to assess its quality, which only increases pu erh's mystique and sociability. "You can tell from the aftertaste, the smoothness," says Lam, pouring out cups with practised hands. The tea is sold in pressed round "cakes", wrapped in paper printed with bold designs that reflect the vintage of each one. Lam's father set up the business, Lam Kie Yuen, after moving to Hong Kong from the war-torn mainland in 1949. But the pair say it is only since the mid-nineties that the market for luxury pu erh -- also, in its less refined forms, a staple of cheap restaurants -- has exploded, with middle-class investors joining the wealthy to buy it up. The Lams are now selling tea from the 1930 to 1950 era for up to HK$200,000 (over $25,000) per 345-gram (12.2 ounce) cake, having bought much of it in cheap truckloads from dim sum restaurants that closed down. "Growth slowed during the economic downturn, but it's still ongoing," said Sam Lam. "As the price is rising, people are buying it less to drink, and more to collect and invest." But luxury pu erh is not just bought to lay aside; it is identified with proud, ancient aspects of Chinese culture, in contrast with the cheap "made in China" goods that have spurred the country's economic rise. In Hong Kong's hectic Mong Kok district, fashionably dressed young men gather at a calm tea house for lessons from qualified tea master Eliza Liu. "It's like a drug -- I'm addicted now," said student Ngan Kan Shing, 21. 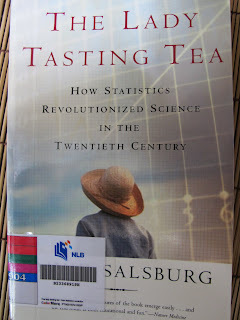 "By discovering tea I feel that I've learned about China." He has been coming to classes for six years, but says: "I still only know the basics." The group examines the colour of each cup of tea before sniffing and then slurping it in respectful silence, as Liu talks them through the value of the aged tea. Grown before artificial pesticides and dried naturally rather than at a high temperature, it has a paler colour and a smoother taste. "Good tea is produced at higher altitude, and also depends on climate," says Liu. "In Yunnan, they say a tea tree can experience all four seasons in one day." The tea is served from small fine china tea sets, used with a tray that drains off excess water. The first cup of each brew is not drunk, as it is used to clean dust or residue from the leaves. After that, a good tea should taste different with every cup, say experts. According to China's state-run Global Times, one batch of top pu erh sold at auction for $250 per gram in 2002, while rare Da Hong Pao oolong can also rival such prices. But Liu and tea professor Yip Man, who taught her the art, are sceptical of the eye-popping prices paid for some teas, preferring to emphasise tea's longtime role in Chinese medicine and thought. "Tea has a philosophy behind it, and it's about health. 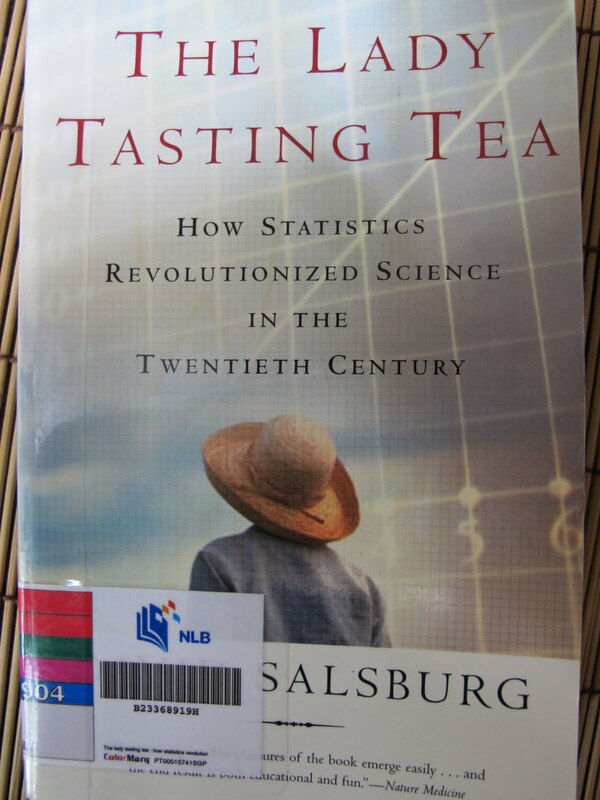 Tea has been very commercialised, but a cheaper tea may also be as good (as an expensive one)," said Yip. "The philosophy is about harmony, bringing people together, peace within the self." The price of pu erh is acknowledged to be boosted by a tight supply, and sceptics argue that investors buying aged pu erh may be made to look foolish as China's newly affluent drinkers move on to fresh fashions like Phoenix Oolong. However Lam says that although the astonishing growth of the last two decades may not be sustained, pu erh is still a good investment. He said a buyer of a good, inexpensive pu erh -- at, say, HK$100 ($13) a cake -- now could expect to make a 10 percent return in a year. "But you have to choose the right tea," he said. Luxury tea houses springing up in London and Sydney indicate China might succeed in exporting its high-end tea culture. And Liu and her students feel meanwhile that they are tapping into much more than a fad. I had ordered 100g of this black tea from Yunnan Sourcing. This black tea comes from Jing-Gu and the black tea leaves looks golden. It has a nice strong sweet scent but I would suggest you do not brew this tea in a your clay teapot as the aroma, even though is very nice, may linger in your pot for some time and will affect the tea brew when you re-use the teapot for other teas. I suggest you use something ceramic when you brew any scented tea. Dedicate one teapot if you really like a particular strong scented tea. I have a separate yixing teapot for heavy roasted TGY and shui xian. For convenience, I recommend you take a pinch (about 10 strands) and brew in your mug. Add hot water (a couple of minutes after boiling) and your tea is ready to drink in 5 minutes. This black tea releases a nice nectar sweet aroma. The color of a brewed tea is like a weak ripe pu erh brew. The aroma makes me think the tea is sweet when I drink the tea. Very nice and pleasant. This black tea also makes a nice chilled tea as well. Costing about $10 for 100g (its quite a lot of tea leaves and will last a long time), I would recommend you include a pack of this Jing-Gu black tea when you place your next order with Yunnan Sourcing. I had the privilege to have purchased this tong locally in Singapore. 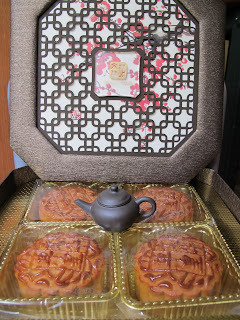 This is the 2005 Haiwan Lao Tong Zhi ripe cake. I called it 'yellow label' for obvious reasons(see pix) as I could not find any recipe number or name for this cake anywhere on the wrapper itself. This cake was kept in Singapore for 5+ years and the favorable weather in Singapore had helped to make this tea a real treat. Yes, good storage conditions and a good tea are also important factors that help making old pu erh taste good. And - ripe pu erh tea can be aged into a wonderful tea. Singapore is an island located in south east Asia. The weather is hot and humid all year long. It is common that the average temperature is about 28-32C with average humidity above the 80% region. Rainy seasons can see the humidity reaching the high 90s. For me, I store my pu erh tea cakes in envelopes (single cakes and bricks) and in carton boxes (tongs) in an odour free room and half opening the windows when I am in the house. The weather in Singapore is similar to Kuala Lumpur in Malaysia, and several tea collectors in this region felt that the pu erh stored here would result in a nice aged tea. 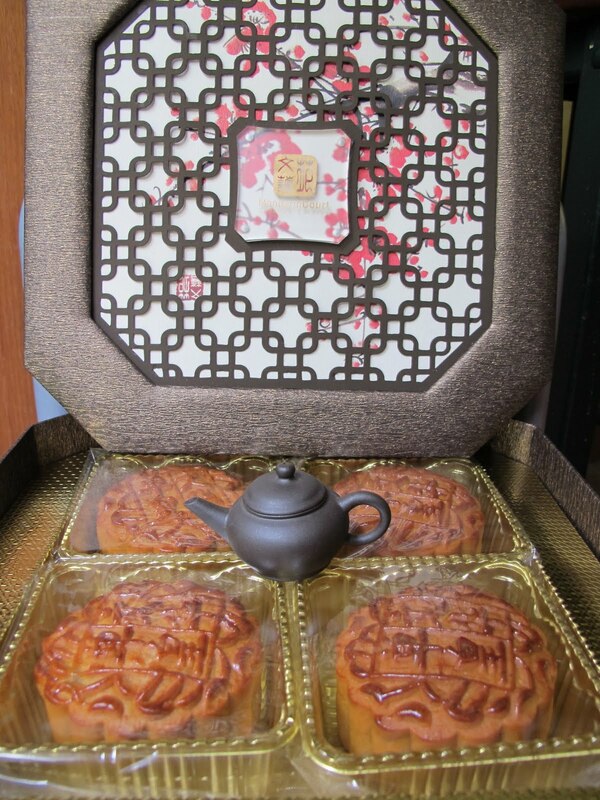 This 2005 Haiwan cake, when brewed, gives off a pleasant aroma of toasted cereal and chinese herbs. Quite an intense scent. It tasted like a nice chinese double boiled herbal soup. It just gives me a smile with every sip. I felt a warm pleasant sensation after drinking a couple cups of this tea. My wife and daughter actually liked this tea - I had observed they drank up the entire cup and sometimes ask for a second round. This tea tasted better when drank hot or warm. I learnt a trick from my daughter - if the tea has cooled down, put it in a microwave and heat it up for 30 seconds (the tea will taste just as good). Do not drink overnight tea though. The "Lau Yu Fat teapot"
This teapot is designed and sold exclusively by Lau Yu Fat teashop. The 180 ml capacity teapot was recommended to me by Mr Lau (teashop owned and run by father and son) senior. 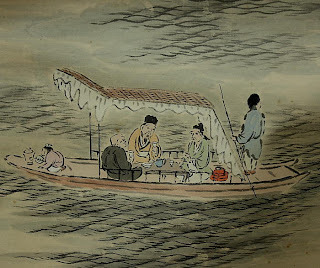 He explained that the rinsing of pu erh tea should be fast, so that you would not waste the tea from prolonged rinsing. He had designed a teapot that allows for a quick pour-out of tea. The 1st 2 pix are that of the teapot I took while I was at their teashop while the last 3 pix belong to the teapot I had purchased. Click pix for larger views. This teapot has 22 drain holes. This is significantly higher than the average 7-9 holes you find in most teapots. I did a quick comparison with my current teapot (180c) I am using, and this 22-hole teapot was slightly faster in the pour-out race. I did not time that race but for those regular teapot users, I felt that faster time was only like an odd second or two faster. Was there a taste difference in brewing the tea..........For me.....no. I normally adjust my brewing times in accordance to the teapot as well as the tea. Moreover, I am a little clumsy with my teapots; already broke a couple the past 2 years.......and I find that I had to understand my new replacement teapots and adjust the brewing of tea accordingly. Some pu erh teas I am drinking may need a few more infusing seconds before I pour out the tea. But I would like to qualify that this teapot may be quite suitable for those teas that brews fast and strong. The price of the "Lau Yu Fat teapot" is now going at HK$800 at the teashop. For the tea drinker who have a chance to visit Hong Kong, this teapot does merit a purchase consideration. I was filling up my car at at a petrol/gas station when I saw this magazine at the newsstand. 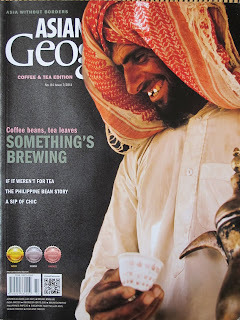 This was the coffee and tea edition (issue84) of the Asia Geographic. It costs $7.50. This particular magazine issue focussed on coffee and tea. The pictures were really nice and the articles made good reading, for me at least. "Antioxidants are a little more complicated to understand, but its these chemicals that get the modern medical profession excited. When a substance oxidises it can produce free radicals - atoms.molecules or ions with unpaired electrons that are highly reactive. Free radicals start chain reactions that can damage cells, causing or accelerating degenerative diseases from cancer to coronary heart disease,to Alzheimer's and Parkinson's. Antioxidants, which occur naturally in tea (in particular, green and white tea) terminate these chain reactions by removing the free radicals and inhibiting oxidisation. 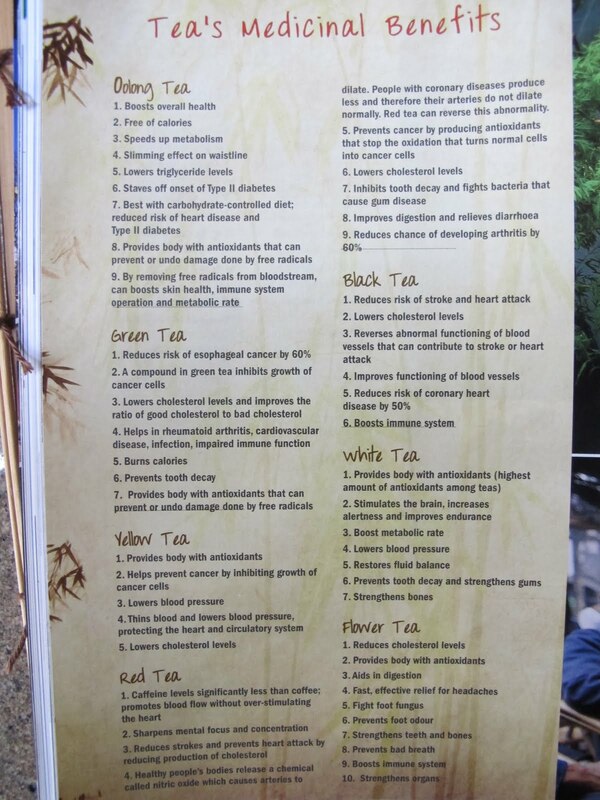 .......A 2005 study at UCLA's Jonsson Cancer Center showed that green tea interrupted the spread of bladder cancer.........that green tea interrupted the signalling pathways involved in actin remodelling, instead trigerring cells to bind togerther and remain localised rather than spreading to other parts of the body. Modern life assaults the body from all sides: pollution, infections, stress and even sunlight take their toll. Put away the dietary supplements, self-help books and punishing lifestyle regimes and go back to one of life's simplest pleasures; drinking a cup of tea. There's never been a better time to put the kettle on. " But I digress - I noticed, I suppose its inevitable, that coffee is considered the beverage of choice in many cities like Singapore. I remember that, not too long ago, coffee machines was a bubbly percolater, where you add a cone-shaped paper filter to the machine, add beans and water to make a brew. Now, the coffee machines......wow, like some futuristic star trek equipment, where you can have combinations of coffee brews with just a press of a button. The coffee machine even takes pride of place in a home. My friend recently called me "come over and have coffee, just bought a &^%# brand coffee machine. The machine was beautiful and mind boggling. The way the coffee is brewed and dispensed seem like some magic or hocus pocus wizardry. Impressive. Its now difficult to ask back my friend "come over for chinese puerh, check out my new gaiwan". To anyone who is reading this and contemplating doing a tea machine......please, get it done quick, I will queue in line for it. "Nobody denies the beneficial healing properties of tea, not as medicine as such, but rather a daily ritual, an excuse for a much needed break, a social lubricant. Drink in that spirit, and health, happiness and eternal life will follow." This 2005 Langhe ripe cake was purchased locally in SIngapore. Yunnan Sourcing gave a description of Langhe ripe pu erh as "Langhe tea factory has been producing teas for more than 15 years. A Menghai based tea factory that specializes in producing Pu-erh tea in the traditional manner. Langhe ripe pu-erhs are special because their fermentation process is "lighter" using less heat and shorter times. The result is a brewed leaf with a slightly greenish-brown appearance. This lighter fermentation process allows for a more gradual transformation into a ripe tea. Langhe ripe teas typically take 2 to 3 years to lose their "dui wei" and become very enjoyable to drink." Maybe its the light fermentation, but I found that this tea is very forgiving in that its difficult to over-infuse the pu erh. My experience with ripe pu is that most of the pu brews fast and strong and leaving the hot boiling water in your teapot or gaiwan may result in an extremely strong cup of tea. This situation occurs when I exceed 5 -8 seconds for the 2-4 infusions especially when brewing loose gong ting leaves and Dayi ripe tea and lao cha tou. Side note - the color of the brewed tea leaves looked uniformly brown - I suppose its due to the hot humid weather of Singapore and that this tea was stored here for 5 years. I found the aroma of the 2005 Langhe to be that of cooked rice. There were also hints of toasted bread. Sweet finish. However, I detected a subtle hint of vegetal, something like a green tea finish, when I drink this tea. Its not unpleasant and I do recommend for ripe pu erh tea drinkers - do purchase a Langhe ripe cake in your next tea purchase. There were some readers that wanted more information on Straits Chinese porcelain teacups after my blog entry on 7 Aug 2009. Straits Chinese Porcelain were used in by the Peranakan community in the the earlier half of the 20th century. Most of the porcelain were specially produced for this community in Jingdezhen China. There were however, porcelain made in Japan, that was used by the Straits Chinese as well. The top 3 pix are Japanese made teacups that are classified as Straits Chinese Porcelain. In my limited handling of Straits Chinese Porcelain, I felt that the Japanese made teacups were more refined in the finish. Some collectors do not recognize such porcelain as Straits Chinese but discoveries of such porcelain in old Straits Chinese homes could not be disputed. Such Japan made porcelain I had seen, had white as the background whereas the China made ones may come in a myraid of colors like white, green, pink, yellow, brown, blue and coral red. The last pix is an unusual China-made nonyaware (straits chinese) teacup. The coral red color is considered a rare color in the nonyaware range of porcelain. It is the company credited with transforming tea into the nation’s favourite tipple more than 300 years ago. But now Twinings has provoked the ultimate storm in a teacup by tampering with one of its best-known and most cherished blends. Fans of the company’s Earl Grey tea are furious that the firm has altered the traditional flavouring and relaunched it as The Earl Grey. They say the new product tastes like ‘lemon cleaning product’ and describe it as ‘dishwater’ served up in a cup. Dozens of angry tea drinkers have posted complaints about the new flavour on the company’s website since the new brand was launched in April. Others have simply described the new product as ‘horrid’, ‘vile’ and ‘an affront to tea’. One wrote: ‘I agree with the other posts here that the new Earl Grey is an awful disappointment! Some tea drinkers are so dismayed by the new blend they have added their names to a Facebook campaign called ‘Bring Back the Original Twinings Earl Grey Tea’. Several have enquired on the campaign page where you can find old stock of the original Twinings Earl Grey on supermarket shelves. Twinings, which was founded by Thomas Twining after he opened a tea room on the Strand in London in 1706, is generally acknowledged to have been the first company to sell the first brand of Earl Grey tea. It launched the blend in 1831, naming it after the Prime Minister of the day, Charles Grey. The distinctive taste is created by infusing black tea with the oil of the bergamot orange from South-East Asia. 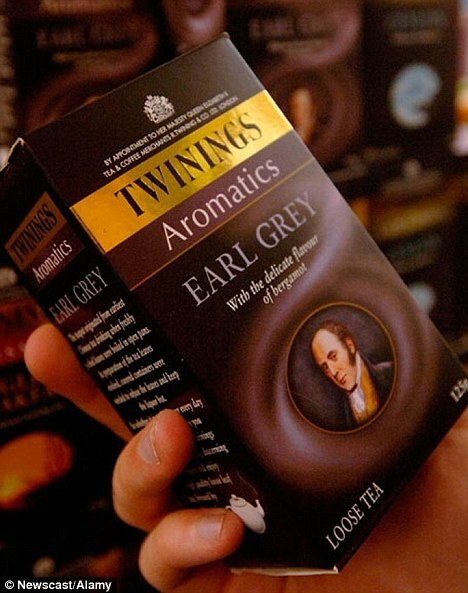 Though Twinings was first to market Earl Grey, its origins have been disputed for nearly 200 years. According to one story, the blend was first created by accident when a gift of tea and bergamot oranges was made to Earl Grey from diplomats in China and the tea absorbed the flavour of the oranges during its journey by sea from Asia. Others say Earl Grey was gifted the recipe for the blend by a visiting Chinese dignitary. Twinings’ new The Earl Grey contains extra bergamot and citrus. According to the company’s website the product has been ‘refreshed’ with an ‘additional hint of bergamot’. A spokesman for Twinings insisted it had carried out extensive market research before implementing the changes. "Nowadays, many people are able to enjoy Chinese tea such as oolong and pu'er thanks to its availability in bottles or cans. By making the tea yourself, however, tea time can be a wonderful experience as you can better understand and appreciate the scent and rich taste of the tea. According to Chinese tea expert Naoko Iwasaki, there are more than 1,000 kinds of Chinese tea, either from China or Taiwan. Iwasaki said Chinese tea is divided into six groups, including green, white and black, and is categorized by the level of fermentation, processing, the color of the leaves and other factors. 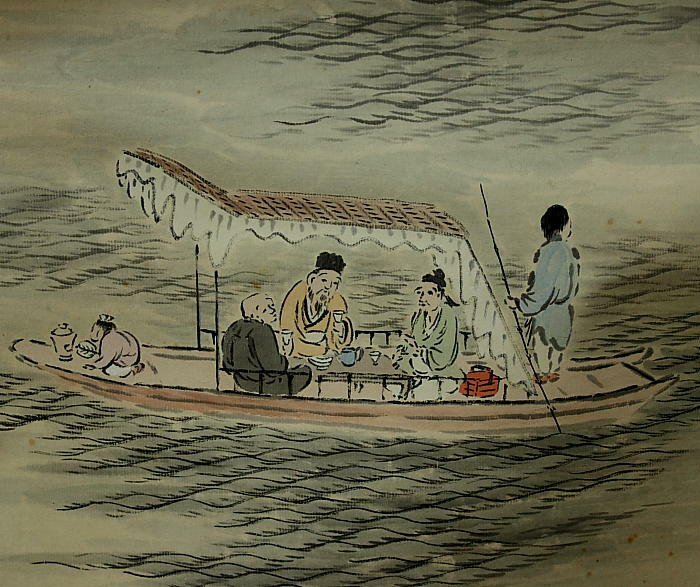 Although the most common tea in China is green tea, the way it is prepared and enjoyed is different from that in Japan. Iwasaki, a tea arts master certified by the Chinese government, has run CHAZENsodo, a salon to share the enjoyment of Chinese tea, in Shinagawa Ward, Tokyo, since 2004. She also is the director of the Japan Chinese Tea Culture Association. For beginners she recommends Chinese oolong tea, the most well-known among blue teas with moderately fermented leaves. "Taiwan oolong tea, in particular, is aromatic and doesn't have any surprises," Iwasaki said. She said uniformly shaped dark green leaves are characteristic of good tea. The joy of Chinese tea is found not only in the flavor but also in the scent and color. In the making of authentic Chinese tea, small, purpose-built tea cups and pots are used. "With them, you can completely enjoy the scents and flavors. Tea can also be prepared in ordinary, small teapots and sake cups," Iwasaki said. In the art of making tea, the teapot and cups are first warmed by pouring hot water in them. Iwasaki says that after the water is poured out, about five grams, or two teaspoonfuls, of tea leaves should be put in the pot. The lid is then placed on the pot to let the leaves steam for a few minutes. When the lid is removed, a refreshing and crisp scent fills the air. At this point, just enough hot water to cover the leaves is poured into the pot and then poured out after a short time. "You can drink it then if you want to, but the first batch of hot water is to make the leaves open," Iwasaki said. She advises that hot water be poured in again, and the tea is ready when about 70 percent of the leaves open. The hot tea in the pot should be poured into a separate container, called yuzamashi, before being served in cups. "You can enjoy the scent in the second serving, flavor in the third and a pleasant aftertaste in the fourth." While taking in the beauty of the light green tea, you can enjoy the slightly sweet, mellow taste, Iwasaki says. After drying, a pleasant aroma will remain in the cup. In Taiwan, a special slim cup is used to enjoy the tea's aroma. After the tea is made in the cup it is moved to another container and the aroma remains in the empty cup. I tried it with a cup that was once filled with oolong tea and I picked up the sweet, vanilla-like smell. "While enjoying the color, scent or flavor, you can also delve further into the art by studying tea utensils or growing areas which may bring you closer to Chinese culture itself. The good thing about this particular aspect of the art is that there are few limits. It is up to you which leaves you use and how much time you spend to enjoy the tea," Iwasaki said." This is a 2005 Xinghai ripe pu erh cake, 357g. I had purchased it in a city teashop in Guangzhou. Yunnan Sourcing's website gave a short description of Xinghai tea as follows : "The Xinghai tea factory is a medium size Pu-erh tea factory which is located in Menghai county of Xishuangbanna. The tea factory was opened in in June of 2002 with an initial investment of just 700,000 CNY. Boasting 80 workers and producing just 5 different pu-erhs in its first year of production. The boss of Xinghai tea factory, Zhang Jian Li (a woman) is a Menghai county native and worked at Menghai Tea Factory from 1994 to 1999 before striking out on her own to create her own Pu-erh teas. " According to a teamaster there at Guangzhou, pre 2006 Xinghai, based on his knowledge, used the traditional method of fermenting ripe pu erh tea. This meant that the tea factory took almost 3 months to ferment the tea in their factory. This teamaster believed that current fermentation times for newer ripe pu erh are slightly shorter now. The aroma from brewing this tea is that of freshly baked bread. The scent reminded me of the aroma of biting into a freshly baked bread roll. The tea is very smooth.....the tea slides down the throat easily, culminating into a nice sweet finish. A very enjoyable tea. I recommend, for this tea, that you make a slightly stronger brew of this tea and/or extending the infusion times a wee bit. Its a pity I only bought a cake for myself in Guangzhou. Fortunately, I saw the same cake for sale in Qiu Xiang teashop in KL, Malaysia......bought another cake of course (below US$20).